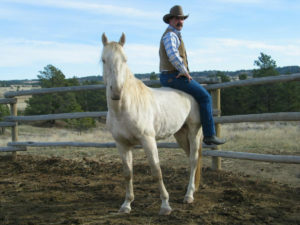 Brandon has spent his lifetime perfecting his philosophy and approach to horse training. It is Brandon’s opinion that a horse will perform and respond to his training because the training is based on natural horse behavior. 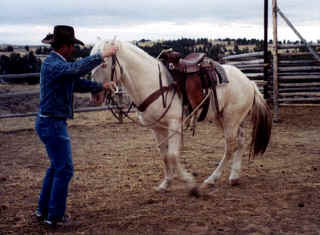 His approach to training is based on bonding and trust between himself and the horse. He considers training and working closely with a horse as being a herd of two, (herd horsemanship) and that is why his approach to horse training is so successful. Brandon’s training techniques are gentle and quiet. Most horses want to please their handler, so capitalizing on that natural desire enables the training to become deeply engrained into the mind of the horse. The results yield a quiet, relaxed horse that is willing to work for the rider and is responsive to a light rein. We do not follow current fad training, since our techniques were used and proven generations before today’s “horse whispering” movement. Brandon doing rope ground work with a 7 year old stallion. Potential dangers a horse and rider may encounter are anticipated. Training is done to expose the horse to many different situations to reduce natural fear of the unknown. 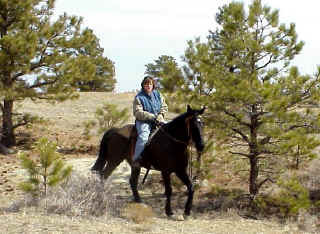 The trust the horse has developed at these times will help overcome fears when new encounters arise. 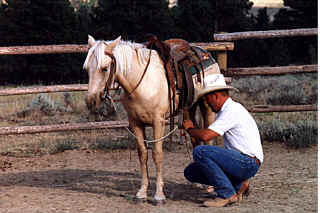 The horse’s trust is easily transferred to other handlers because of the unique way Brandon establishes it. Brandon runs an open shop during training sessions. This means that owners of horses currently undergoing training are welcome to stop by any time to discuss and observe the horse’s progress. This allows owners to see the ongoing lessons that his or her horse is currently working on. This also allows the owner a glimpse into what follow-up exercises will be necessary once they get their horse home! 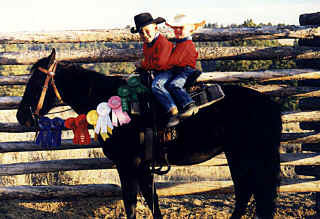 Brandon un-tacked on a 4 year old Stallion at the end of his 30 day training. At right is a client horse that has what we call a 30 day training. It is very typical to be able to slide off the rear exit, walk underneath, rope feet and tail while mounted, flail a slicker back and forth and over the horses head, rein, stop and back with only leg cues, as well as a variety of other tasks at the end of training. The horses acceptance is indicative of the depth of training. It is widely believed that this kind of behavior from a horse isn’t expected until it is much older. Our 30 day horses routinely outperform much older horses. Brandon has authored articles and given training advice in publications such as Western Horseman, The Gaited Horse, Equestrian Network Magazine, The Journal of Equine Veterinary Science and others. He is also featured in the books Be The Pack Leader by best selling author Cesar Millan (The Dog Whisperer) and Walking With Friends. Customer service is very important to us at Hashknife Horses! We want you satisfied with the results you get for yourself and your horse, whether that is from the purchase of one of our horses or the training you receive from Brandon.